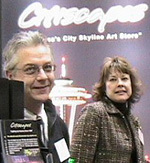 The story behind Citiscapes begins in 1989, when we came across a beautiful, glowing depiction of the Seattle skyline while shopping at a specialty gift store. This was our first encounter with fiber optic art and the shimmering lights. This stunning beauty made an unforgettable impression. In 1995, our interest was reawakened in this art form when we found smaller versions of lighted city skylines that were made in China. We decided to make these displays ourselves, with one goal in mind. To create beautiful lighted city skyline art displays that would surpass the quality, size, selection and the amount of lights that were currently available on the market; lighted art, so unique, that it will get noticed by people of all ages with their first encounter. Starting with our Seattle skyline, we began creating prototypes, in different sizes, using several different illuminator motors and learning to weave and seal the tiny fiber optic strands into each piece to create maximum beauty. In the process, there were plenty of birthday presents and holiday gifts to family and friends. We had cabinetmakers, begin creating wood frames to highlight these dramatic pieces. The skylines became small jewels of fiber optic art that delighted others, and we’ve been at it ever since. Today, years later, our company is still family-owned. In spite of our growth and the increasing demand for these gorgeous city skylines, we have maintained our initial commitment to quality, selection and “straight forward” customer service -- traits that have been hallmarks of Citiscapes from the beginning. We have surrounded ourselves with experts and professionals for each aspect of production. Each city skyline display is custom made right here in the USA. We want it that way and yes, it is worth it. Our goal now, is to create one of these truly unique modern art pieces for YOU. Due to increased customer demand, our product line and galleries have expanded over the years to offer hundreds of city skylines from around the world. Everything we offer is designed to be treasured and enjoyed for many years to come. We take pride in what we do and are committed to serving you. Thank you for the opportunity and take care. Your family, friends and co-workers will enjoy getting a breath-taking view of their favorite city, hometown or office location. We have great gifts for any occasion and budget. Give them something that they will truly appreciate!